Description The meiping shaped jar, with broad round shoulders and narrowed everted foot, is decorated on four sides with composite mystical creatures that combine the head, scales, and flames of a dragon with the body shape, bushy tail, and paws of a lion. Each lion-dragon stands on a rock jutting from crested waves; scrolled clouds swirl overhead in the sky. Buddhist emblems and Taoist Treasures are painted on the neck alternating with cloud scrolls; included are The Conch, The Artemesia Leaf, The Musical Stone, and The Umbrella. The lid, which flares out over the shoulder and is topped with a radish-shaped handle, is painted with a landscape of mountains, trees, a humble hut, and a river where a man fishes. 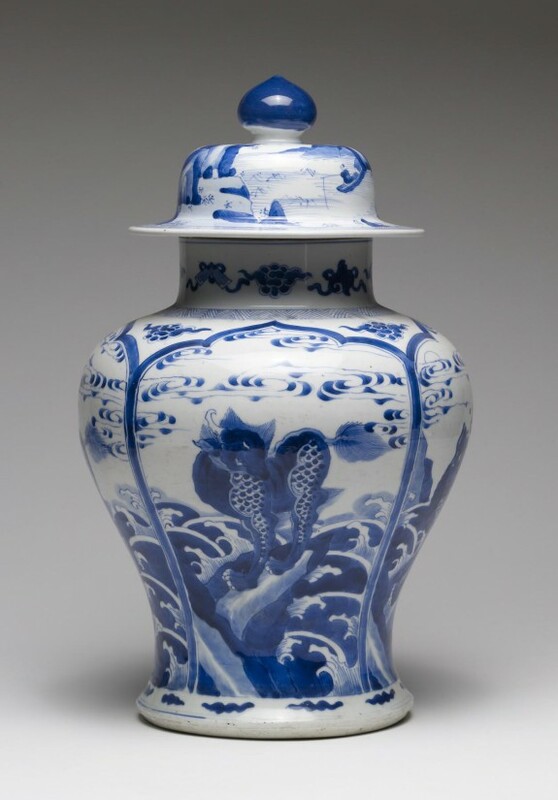 By the late 1600s, groupings of five or seven Chinese porcelain vessels with alternating shapes were often displayed over doors in European homes. A complete set was called a "garniture." 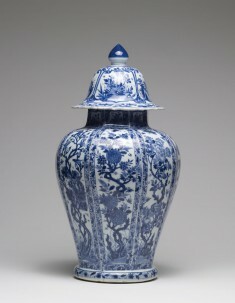 This jar, painted with underglaze cobalt blue decoration, is a garniture piece made for export. Provenance William T. Walters, Baltimore [date and mode of acquisition unknown]; inherited by Henry Walters, Baltimore, 1894; by bequest to Walters Art Museum, 1931.